Here’s a delicious jalapeno sauce that’s easy to make and can be kept in the refrigerator for a week or so or frozen for use during the winter. Cut the jalapenos in half lengthwise and remove the seeds and stems. Slice them thinly. 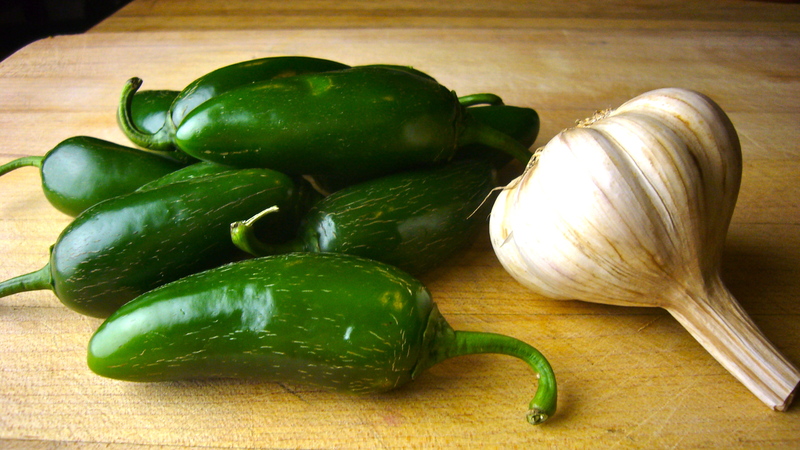 Sauté the jalapeno slices and garlic in the olive oil until very tender. Add a little water along the way if necessary to keep the jalapenos from burning. Purée in a small blender and add salt and pepper if desired. BY THE WAY, YOU SHOULD LET PEOPLE KNOW THAT THEY MUST WEAR GLOVES WHEN CUTTING JALAPENOS. SEEMS LIKE A NO BRAINER AFTER THE FACT, BUT IT WOULD HAVE BEEN GREAT TO KNOW BEOFRE THE 12 HOURS OF EXCRUCIATING EMERGENCY ROOM PAIN. ALL FOR A SAUCE. JUST A SUGGESTION. You live up north huh?